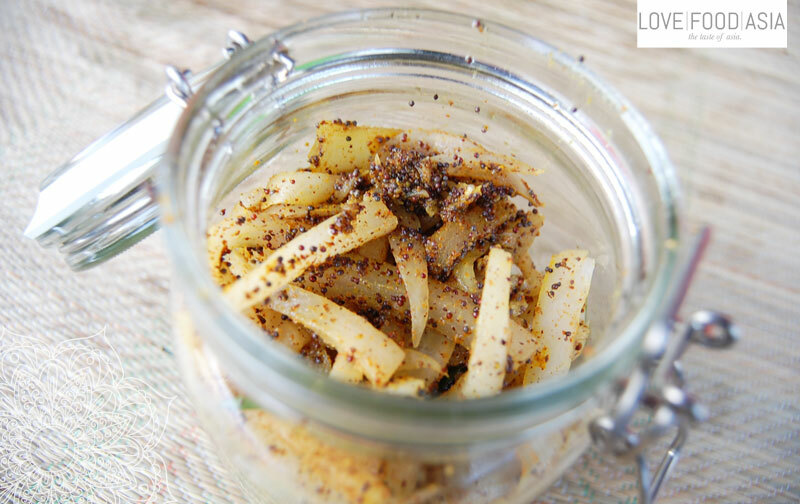 Here´s another recipe for easy and super delicious pickles. In Nepal we had those as a side dish of Dahl Bhat (the national dish of Nepal). Every mother, guesthouse and restaurant has it´s own recipe. This is the one from Love.Food.Asia. and you will need some time before you can eat it! Wash, and discard radish tops and trim root tips.Peel the outer layer and cut into 2,5 cm (1 inch) slices. Place on tray and sun-dry for half a day. If there is no sun, the radish can be dried in the open air for a whole day. Place the brown mustard seeds in the sun to dry along with the radishes. Grind mustard, schewan pepper, red pepper. Place the radish pieces in a bowl and combine with the rest of the ingredients and 2 tbs oil. Knead with hand thoroughly by rubbin the spices to the radish. Let is stand for 1/2 hour before place in a jar. Add the marinated radish pieces in a glass and press them to the ground top remove all the air between. When it is packed thoroughly, add 2 tbs oil on the top and cover with a lid. Let is stand in a warm place or in the sun for 4-5 days until it is fermented. Once ready store in a cool, dark place and remove pickles only with a dry, clean spoon!